Three representatives of the BARILLA team, Roberto Bassi (chef) and Ilaria Rossi from Barilla Academia and Beatrice Biassini from Madegus, were in Serbia from 3rd to 5th December to give demonstrations of cooking and advice on meal nutrition to cooks from schools taking part in the Strength2Food project. Two primary schools were selected for the demonstrations: “Kosta Trifković” in Novi Sad and “Dositej Obradović” in Belgrade, chosen because of the availability of suitable facilities for giving demonstrations and the timing of lunches in those schools. Accompanied by the EUTA team, the first day was a visit to each school to see the facilities and discuss the practicalities of the demonstrations on the following two days. The Barilla representative in Serbia accompanied the teams to both schools to help with translations and to contribute ingredients for the demonstrations. Several local growers of organic produce had agreed to provide vegetables for the demonstrations at each school. Because of the time of year these were mainly root vegetables and seeds (beans and peas), which the cook from “Kosta Trifković” said she would prepare for the demonstrations the next day, getting up at her usual time of 03:30 to start work in the school kitchen at 04:30! At each school Roberto Bassi demonstrated pasta double-cooking and how to make a vegetable lasagne, on this occasion using pumpkin, beetroot, onion, peas, black and white beans, together with leaves of mangold, all organic. While the lasagne was cooking, Beatrice Biassini gave information on meal nutrition and described how Madegus has been working in schools with educational activities to get children interested in nutritious food. 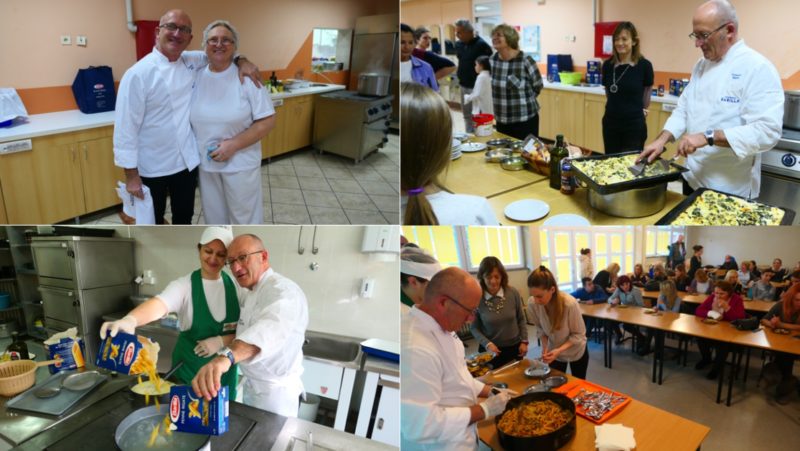 Cooks from all our 29 Strength2Food schools were invited to attend the 2 h demonstration event, and over the two days we hosted representatives from 15 schools and 13 school chefs from many parts of Serbia. Three representatives travelled over 200 km from Ivanjica; others came from Loznica (150 km) and one enterprising cook took a day off to come from a village school near our project partner in Arilje (190 km). A television crew from Serbia’s state television channel RTS2 was present at both events, filming for an educational programme to be broadcast in the New Year. On both days we had around 35 adults present for the demonstrations, but another ca. 35 young children were present for the demonstrations at “Dositej Obradović”. The cooks were delighted with the demonstrations, parents also writing down the recipes and cooking procedures, and children were also fascinated to have foreigners visit their school, with whom they could practice their embryonic English skills! So, the BARILLA team returned to Italy knowing that the events had been much appreciated, and we talked about the possibility of repeating the demonstration at another school during the next project annual meeting in Belgrade in May, 2019.